~ NOTE THIS IS NOT AN ADMISSION TICKET FOR THE CONFERENCE ~ The mission of National Association of Economic Educators (NAEE) is to advance economic and financial literacy by serving educators. Membership is $50 per year running from January to December. Dues paid online in 2018 are for calendar year membership through December 2019. NAEE co-sponsors, with Council for Economic Education (CEE), a conference in October or early November each year, and sponsors a smaller conference for professional development in early spring. Educational Resources, new product announcements, networking opportunities, poster sessions and refreshment breaks. Register by Aug 31, 2018 to be included in the program. 6 ft. table table top includes one (1) COMP Standard Admission. Additional attendees with your company can purchase a Standard Admission Ticket at $325. The Sheraton Atlanta Hotel’s special conference rate is $169 a night. Hotel room rates are subject to state and local taxes, currently 16.9% (sales tax 8.9% and occupancy 8%) plus a State Hotel Assessment Fee of $5.00 per room/per night. The special rate is being honored 3 days prior and 3 days after the Conference dates. Reservations can be made online at Book your stay with the Sheraton Atlanta today! If you prefer to book by call, you can reach the Reservations Department at:(800) 833 – 8624 — be sure to mention you are attending the 57th Annual Financial Literacy and Economic Education Conference to receive our special conference rate. Reservations must be made by September 25, 2018. Check-in time is 4:00 pm and check-out time is 11:00 am. Attendee reservation must be accompanied by a first night room deposit or guaranteed with a valid major credit card. The Hotel will not hold any reservations unless secured by one of the above methods. Cancellation of individual reservations must be made up to 24 hours prior to arrival. 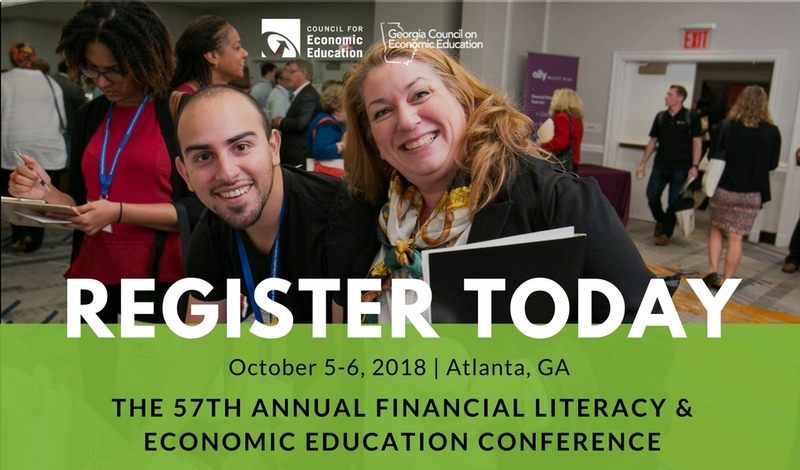 The Council for Economic Education’s 57th Annual Financial Literacy and Economic Education Conference is a nationwide meeting of K–12 educators, local CEE affiliates from across the country, Federal Reserve partners, and other educators in this field. The conference features a diverse selection of professional development workshops on economic and financial literacy geared for elementary, middle and high school levels. Topics include pedagogy and resources, curriculum strategy for schools/school districts, teaching strategies, assessment and research, new programs and best practices. In addition to the workshops, outstanding speakers address current economic and financial topics to enable educators to bring these perspectives back to their classrooms. The conference also features special roundtable sessions led by master teachers to discuss shared issues and successes, and informal opportunities for networking.